Still not sure what to get Dad this year? 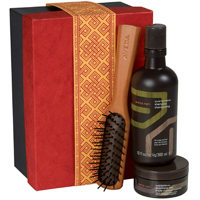 Forget the boring tie and give him one of these great Father’s Day grooming finds. Does your Dad suffer from stubble trouble? This luxurious shaving starter kit has everything he needs for the perfect, classic barbershop shave: pre-shave oil, shaving cream, after-shave balm, a badger-hair shaving brush, razor and four extra blades, all housed in a water-resistant black leather case. Bye-bye sandpaper face! If he thinks the only hair product worth using is his generic shampoo, show him what a good hair care routine can do with this strand-saving set. It features a scalp-balancing shampoo to moisturize and add shine, a micro-fiber texturizing clay to provide flexible hold and a wooden styling brush to detangle and lift roots for natural volume. 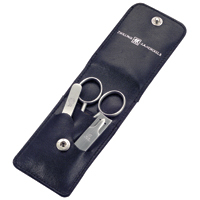 This three-piece precision tool set is a great way to introduce Dad to the joys of good grooming. It features nose/ear hair scissors, a folding nail clipper and a nail cleaner, all made of corrosion- and wear-resistant stainless steel. 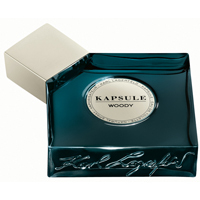 For Dad’s with serious style, this musky unisex fragrance is the perfect pick. Part of fashion guru Karl Lagerfeld’s fragrance collection, this wood-based scent features notes of cedar, moss and plum that create a luxe, outdoorsy fragrance. The forest green square bottle is a miniature work of art, so it will be right at home on the bureau of your fashion-forward father. If your Dad’s usual morning routine consists of a grubby bar of soap, open his eyes to this essential collection. It features a 2-in-1 facial cleanser and toner to remove dirt and oil, conditioning shave cream that also acts as a soothing after-shave oil and a lightweight SPF moisturizer to protect and hydrate dry skin. After just one use, you can bet he won’t ever go back to that gross old bar soap! For the eco-conscious father, this inexpensive organic travel kit is not to be missed. 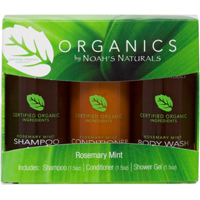 It contains a body wash, shampoo and conditioner enriched with organic extracts of rosemary and mint to awaken the senses and soften skin and hair, all for under $10! That’s a deal that will really make Dad proud. This six-piece kit features everything he needs to keep his face looking fab. It contains travel sizes of all the essentials: decongesting cleansing gel, exfoliating scrub, conditioning shave oil, cooling shave cream, soothing after shave balm and an anti-puffiness eye cream. He’ll be the best-looking Dad on the block!